Currently the majority of Bright Hope World partnerships in Zambia are focused on getting HIV/AIDS orphans into school by supplying school fees, stationary and uniforms. The orphans are still looked after in the community by relatives or neighbors. However hunger is a huge issue and is potentially going to get worse. 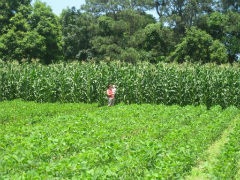 The current average yields for subsistance farming in Zambia is 1 tonne to the hectare, which is very poor, as it can reach 10 tonne per hectare. 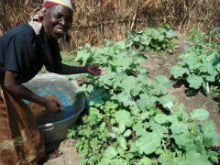 Bright Hope World has been challenged by this need and is now running training programs to teach the "Foundation for Farming" system developed in Zimbabwe to key people in each partnership, so they may in turn train people in their communities. 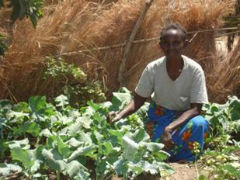 In 2006 Bright Hope World along with Samfya Community Care Providers started a kitchen garden loan programme. It was identified that the orphans being looked after in the villages by guardians were not getting enough to eat. They were hungry. The partnership ran training programmes, first for church leaders and then for 40 selected guardians who were trained in Biblical principles of working, gardening techniques and financial skills. The 40 were then given small loans of about US$15. 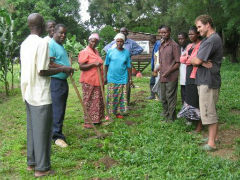 Jerry and Hayley Field from Nelson, New Zealand, have been based at Maplehurst Farm in Kabwe, Zambia and are involved in the oversight of existing Zambia partnerships, the introduction of micro-enterprise into some partnerships, the development of training programmes and resources for partners and beneficiaries, and the establishment of model plots for learning at Maplehurst Farm. They attended the Foundations for Farming training centre in Zimbabwe in 2009 and have developed a small demonstration plot of 1/4 ha showing what can be produced with faithful techniques. Eight training courses have been run to train the trainers, and now many of the partnerships in Zambia are running yearly courses for community members. Yields have been increased by up to 500% in most cases within 2 years, giving a huge lift to peoples' lives. Not only do the guardian families of the orphans cared for by Bright Hope World benefit from this garden training and the access to small loans but the general community also benefits as more and more people start eating better, becoming self-sufficient and encouraging others in the community to do the same. The resources Zambia has in terms of land and water are extensive, and the training and loan programs aim to help local people be faithful with what they have. This creates a program that is very sustainable and gives the Zambia people dignity in providing for their own families. Jerry and Hayley Field have been working with Bright Hope World in Zambia since 2005. Hayley is a trained horticulturalist and Jerry dabbles in accounting and business with a horticultural background. 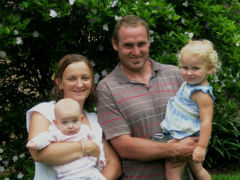 They have two children, Sophie and Lucy, and have been sent out to work with BHW by Hope Community Church in Nelson, New Zealand. The vision for the project is to empower the current Bright Hope Zambian partners to be able to run micro-loan programmes within their existing projects. - Set up demonstration kitchen gardens, cropping, and livestock. Include trials to assess better techniques for growing food. “My name is Albina Chabala. My church selected me to attend a training being conducted by SCCP. In addition to the training I also received a kitchen garden loan for ZMK 50,000 ($US15). The training and kitchen garden loan has changed many things for the better in my household. A few years ago I lost my husband. After his death I became depressed and unproductive. I stopped trading fish and I did not manage our money very well. Our family was really suffering. We were only eating one meal a day and my children were often sick. The training that I attended at SCCP challenged the way I thought about a lot of things. I decided to stop feeling sorry for myself and start being productive once again. I also learned how to manage my money, how to save and plan ahead for things I wanted. I used to keep a very small kitchen garden, just some onions and kale. At the training I learned how to invest in my soils. I learned how to grow a variety of vegetables and how to care for the health of my plants. I have now expanded my kitchen garden and have constructed a fence around it. I grow tomatoes, kale, Chinese cabbage and carrots. Thanks to my garden I am now able to provide 2 meals a day for my 5 children and 2 adopted children. By growing my own vegetables I am able to reduce my household expenditures by ZMK 28,000 a month. While we still do not eat three meals a day our lives have improved greatly, especially for the children who are now much healthier. I even helped my friend start her own garden. From my first crop of vegetables I have sold ZMK 155,000 worth of surplus vegetables and expect to sell another ZMK 120,000 before I plant my second crop. If I can plant three crops of vegetables this year I expect to earn ZMK 725,000 from the sale of my surplus vegetables. I am saving some of my money so that I can fix up my house. When I die I want to leave behind a nice house as a testimony to the impact my church has had on helping me during this hard time. I am also saving so that I can send the children to school. I would like to join an agricultural cooperative for cheaper access to fertilizer and maize seed for my farm which I also hope to expand. I have also made plans to re-start my fish trading business. I will sell my first fish consignment in December of this year.